I’m trying to take photos of what remains of the HIV community in Borei Keila, courtesy of talented photographer Nicolas Axelrod. THE long-awaited eviction of the HIV positive families from Phnom Penh’s Borei Keila community began Thursday, with twenty families being taken to Toul Sambo, some 20 kilometers outside the capital. Joel Montague is a collector, and I mean a true collector. Sure he has between 1,600 and 1,700 picture postcards of Cambodia from the French colonial era as well as the world’s largest collection of hand-painted Cambodian shop-signs, but you really know he’s a collector when he talks about and holds one of his postcards. “It’s a little window on the world that people have ignored,” Joel, 77, tells me. Through his postcards, he reimagines how the French imagined Cambodia and traces the evolution of these projections. The German cultural critic and philosopher Walter Benjamin wrote of a true collector that as he holds his objects in his hands, “he seems to be seeing through them into their past as though inspired.” And Joel certainly sees into every postcard its distant past, imagining the sender, receiver, photographer and subject. Joel is trying to renew interest into the French colonial era, telling me that too many historians have ignored the French influence in Cambodia. Benjamin writes that “to renew the old world—that is the collector’s deepest desire,” and though Joel is not nostalgic for colonialism, he is giving rebirth to these postcards, giving them another chance to tell a story. Benjamin calls collectors the “physiognomists of the world of objects”—but a postcard collector is literally a physiognomist, interpreting the personalities and prejudices through the faces of others. The Benjamin piece I’ve been quoting from is about his library and his enthusiasm for old books, and I can have those bibliophilic leanings as well. I suspect the first place where I’ll get to reunite my books from college, Portland and Asia will be the first place that will feel like Home and not some temporary dwelling. But I’m no “genuine collector”, in fact, I’d never met someone before Joel who was. For me, books are akin to souvenirs, but for Joel, I think, postcards are something more. “Not that they [the objects] come alive in him; it is he who lives in them,” Benjamin wrote about collectors. All of a sudden, the cars and motos in front of me started swerving erratically, nearly resulting in a head-on collision. I was on Mao Tse Tung Blvd—one of Cambodia’s busiest thoroughfares on my way to an interview, and as we got closer, it became clear what was causing the havoc. A young boy was driving his remote control car in the middle of the street. The boy snickered as the cars zigged and zagged to avoid his toy, while standing next to him, a middle-aged man dressed in an all black Lenin suit guffawed. Now, I don’t know for certain who lives in the compound where the pair were standing (it’s rumored to be Hun Sen’s nephew). Whoever owns it often leaves the gate open, and inside you can usually spot a Bentley, two luxury SUVs, a pair of identical Ducatis, and a metallic yacht. Despite the developmental gains that Cambodia has made over the last decade, if you’re rich, you can do whatever you want. No one will stop you, and no one will dare drive over your toy car. Over the years, the Stung Meanchey dump has become a journalistic cliche. It has been written about, photographed and filmed, and as a result, the hundreds of dirt-poor families who work the forty hectares of steaming trash have become international icons of third-world poverty. But next month the notorious dump will finally close, and the 1,000 tonnes of trash that arrive each day will be heading to a new dump located about 15 kilometers outside of the city, leaving tourists, expatriates and journalists in need of a new stand-in for the excesses of modernity (which the community, quite literally, lives off of). Scavengers scour the dump for recyclables at the Stung Meanchey dump. Despite the years of press attention, donations and NGO-run schools and training programs, life for Stung Meanchey’s residents remains grim. Last week, Phorn Sreymean, 14, sprinted towards an incoming garbage truck, hoping to fish out plastic bottles and cans before the dozen or so other people clustered around the back of the truck get to them first. 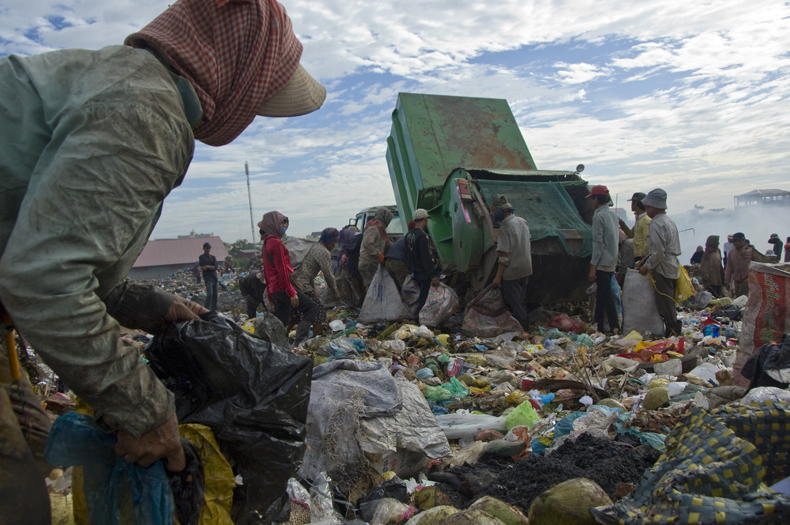 When the truck lifted its tray, garbage rained down and the bravest of Phnom Penh’s scavengers – including Phorn Sreymean – stood right below hoping to scoop out the most lucrative recyclables. Scavenging can be a high-risk occupation, especially for young people. In February, a cart on top of a dump truck fell onto a teenager, and she fell headfirst onto her metal pick, killing her. The garbage fires at the Stung Meanchey dump are a long-term hazard, releasing large amounts of dioxins into the air, a known cancer-causing agent. Phymean Noun told me that her students often have skin, hair and lung problem, even though most no longer work at the dumpsite. Yet news that the dump, which opened in 1965, will be closed has instilled fear, rather than relief, to the 1,000 families people that depend on it. “I am worried that when this dump site moves I won’t be allowed to work anymore,” Phorn Sreymean said, adding that losing her current daily income of about 5,000 riel ($1.25) would spell disaster for her and her family. Though it’s easy for journalists in Cambodia to role their eyes whenever an international reporter helicopters in and tries to capture the Dickensian aspects of third-world modernity, international attention has helped bring in funds to the NGOs that train members of the dump community. A feral dog ran through the the Group 34 community with a used sanitary napkin hanging from his mouth while being chased by three naked, uncircumsized children. After a suspicious fire, a poor but stable Phnom Penh community has become a squalid ghetto where fresh trash and the scorched remains of their belongings sit in heaps behind their temporary shelters. 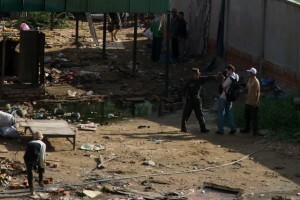 But, the residents worry, their lives could become even worse once they are evicted. The Group 34 community watched their community burn to the ground a month ago in a blaze that killed a child. Now, the government is not allowing them to rebuild their homes, a sure sign, they say, they will be forcibly evicted soon. Currently, they live in ramshackle shelters made from donated tarpaulins and the charred remains of their old homes. Even the land has transformed. The fire turned the community’s muddy, brown paths jet black. The police version of fire that places the blame on an irate drug addict doesn’t quite add up, and no one I talked to believes he acted alone. When I asked one community member why they were being forcibly evicted, he told me, “We’re surrounded by rich people,” and refused to elaborate further. The community in Tomnup Toek, Phnom Penh doesn’t mind moving. None of the villagers I talked to were particularly nostalgic about the place, especially now that 150 of their homes have been destroyed. They just don’t want to live 50 kilometers out of town, which is where the government says they will be moving them. They told me they were “a community of market vendors and construction workers”. They needed to be in the city for their livelihoods. “We eat what we work,” one person told me, meaning every dollar they get is immediately spent on food. They have no savings to support their families while they learn to cultivate rice, the main occupation at their relocation site. 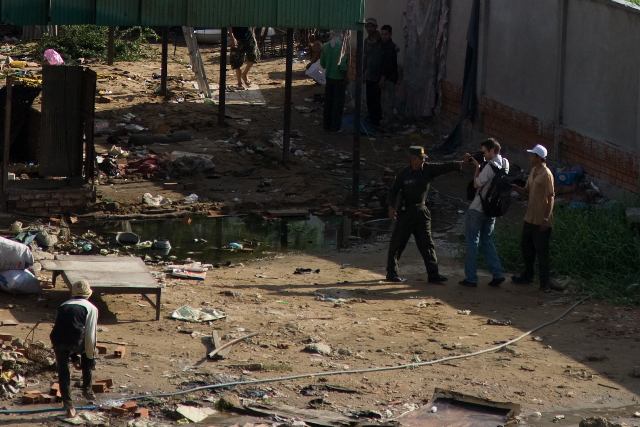 So they did something as far as I know no Phnom Penh community has done before: They found an alternative site for the community’s 258 families. The owner is willing to sell the land to the city at a cheap rate. The Group 34 community representatives wrote letters to the authorities with the proposal, and the government’s response has been a predictable silence. This, they told me, is a chance for the government to finally get some good press when it comes to forced relocations. Maybe, just maybe, if people and organizations make enough of a fuss, the government will spend that little extra to buy them an urban plot. If not, some residents have vowed to fight back when the police come to evict them. People—who feel they have nothing left to lose—going up against armed police could lead to disaster.